The widening of the Mapusa-Calangute road has given commuters some respite. The 8-km stretch has witnessed several fatal accidents and heavy traffic jams. Sources say that the Mapusa traffic cell had repeatedly asked the PWD to widen the roads to reduce accidents, but no action was taken. When contacted, PWD officials, on condition of anonymity, said that the work involved the three constituencies of Calangute, Siolim and Mapusa, and hence, could not be taken up earlier due to differences between political parties. The road, which was just eight meters wide earlier, has now been widened to 15 meters with a divider in the middle. The entire widening project costs Rs 8 crore. The first phase of the work undertaken by the PWD has been completed from the Parra junction to the Verla-Canca junction, and the residents are already feeling the difference. The second phase of the work from Verla junction to Mapusa has already started and will be completed in a few months. The third phase, from Parra junction to Calangute Tinto, has also started at some places as there is an issue with the land acquisition. However, officials say the issue will be sorted soon. Locals said that the widening was a must as the narrower road had claimed many lives. “During the peak season and also at peak hours daily, this road witnessed huge traffic jams. The widening was one of the main demands of the people,” said Wilbur Fernandes, a Parra resident. Verla-Canca local Sagar Naik said that the narrow road had made commuting difficult, but with the first phase of the widening completed, travelling was easier. The widening work has been initiated by Calangute MLA Michael Lobo and supported by Deputy Chief Minister Francis D’Souza and WRD Minister Dayanand Mandrekar. 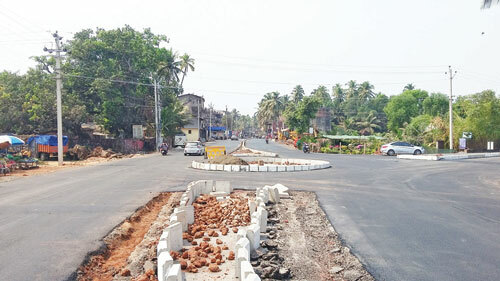 “We have taken up this work on priority as the residents complained of frequent traffic jams since it was the only road for tourists to reach Calangute, Baga and Candolim from Mapusa,” said D’Souza, adding that the remaining phases would be completed soon.